Because of a really great sale I ended up with about 30 cans of Pillsbury Grand’s Biscuits. I ended up giving most of them away, but I still have a few cans I wanted to do something with. 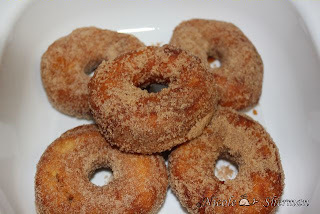 I decided to make Super Simple Cinnamon Sugar Donuts. These are definitely not for your calorie conscious or anyone on the Summer Slim Down Challenge, but they are REALLY good especially warm. Quick, Easy, Cheap, and Delicious! Cook donuts until they are golden brown on each side cooking long enough to insure they are done in the middle. Flip several times during the cooking process. Make them in small batches to insure you are not crowding the oil. I made 2 at a time. As each donut comes out of the oil add it to the cinnamon sugar filled zip back, close up and shake, then set the now cinnamon sugar aside and continue the process until you are done. Wordless Wednesday - Shopping Cart Makeover!